Follow the life of a cocoa been from tree to artisanal chocolate during this 2-hour tour of Granada's Chocolate Museum. Try your hand at making some chocolate and learn about its role in the Nicaraguan economy. Entrance fees, chocolate tasting, and round-trip hotel transportation included. Your decadent day at Granada's Chocolate Museum begins with pickup at your Granada hotel. 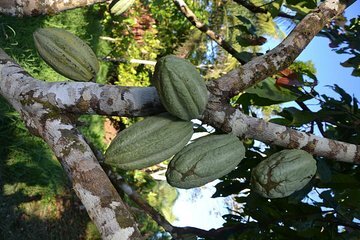 Transfer to the Chocolate Museum, also known as ChocoMuseo, where you'll learn about the life of a cocoa bean from tree to tasty treat. Tour the museum to gain a better understanding about the chocolate-making process and the role of chocolate in Nicaragua's economy. Try your hand at making some chocolates from 100% organic Nicaraguan cocoa beans in the workshop space. You'll also get a chance to learn how to prepare a traditional Nicaraguan cocoa-based drink. End your sweet experience with drop-off back at your Granada hotel.